Some great feedback from our satisfied clients in Westbury-on-Trym and across the country. "Thank you for your extremely comprehensive report. It will be of immense help when deciding on the works we would like to carry out on the property. We have decided to take your advice and move into the property and live in it for a while to assess our requirements." "Thanks for getting back to me so promptly on Friday – I really appreciate it. I duly passed the findings on to the agent as there is going to be some correction involved to make it worth the hassle. Once again many thanks for an excellent survey – far better than the gentleman in Norwich who we used over here last year who failed to inspect one of the three roof spaces and another in Cambs who didn’t even get up into the loft space of a bungalow!" "Thank you so much for all your advice today. That was so very helpful, not only with the structure of the property but especially with your comments about the whole set up. I can see that we were within a gnat’s whisker of entering a complete can of worms… Thank you so much for saving us from making a stupid mistake." 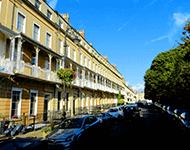 Providing a full range of building surveying services to owners and occupiers of residential, commercial and industrial premises in and around Westbury-on-Trym, the Right Surveyors fundamentally understand that each client has different budgetary and unique property requirements. Give us a call on 0117 21 21 214 or Freephone on 0800 880 6024. Chartered surveyors covering Westbury-on-Trym, Henbury, Sea Mills, Stoke Bishop, Horfield and the surrounding areas.